I've had two driving instructors before Nick and you could say it has been third time lucky for me! With both previous driving schools, I gave up my lessons due to a mixture of me feeling the instructors were both stringing the lessons out for more money and also me feeling that their general approach didn't have as much structure as I felt I needed. From day one Nick, my instructor this time around, was really honest about what he felt was the best way to learn, as well as open to taking suggestions on the best way to work through the lesson plans in the LDC Driving Skills Workbook, which I felt also really helped me. 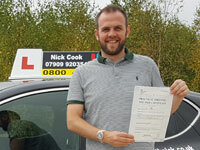 Nick was my instructor for around 10 lessons and I can honestly say that his laid-back, honest approach and general friendly manner is the main reason that I can say 'I've just passed my test!' I only wish I had an instructor like Nick the first time around, as I would not have had to wait over 10 years to have the confidence to stick with it and pass my test. 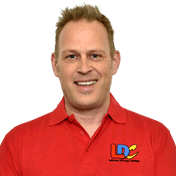 Many thanks, Nick, I will definitely be recommending you and your driving school to friends and family.